It can be tricky for a church to find relevant ways to connect members to the missionaries the congregation supports. Gashland Evangelical Presbyterian, a church of 325 in Kansas City, Missouri, found a way to make the connection process more interactive. The church got rid of a sparsely decorated, rarely updated board and created an interactive lobby focal point. A wall display features a map with printed cards about each missionary. There’s an interactive program on an iPad that allows people to learn more, watch videos from a selected missionary and directly send them a note of encouragement. Additionally, there are spaces to feature individual missionary initiatives and a cabinet to collect any goods they might need to do their work. The mix of paper cards and technology was an intentional decision to make sure members of all generations could connect. But building this interactive space wasn’t the only change in sharing missionaries’ stories. Gashland added smaller, satellite mission boards by the entrances to worship spaces. On the first Sunday of every month, during the service they show a video where a missionary is speaking directly to the congregation. Plus, the church shares specific mission based prayer requests each week. The new mission lobby display seems to be working. Oftentimes missions work can seem like a far off, side project that a church does. Gashland was not only intentional about consistently communicating how mission dollars were at work, they also gave clearer paths for how congregants could support their missionaries. 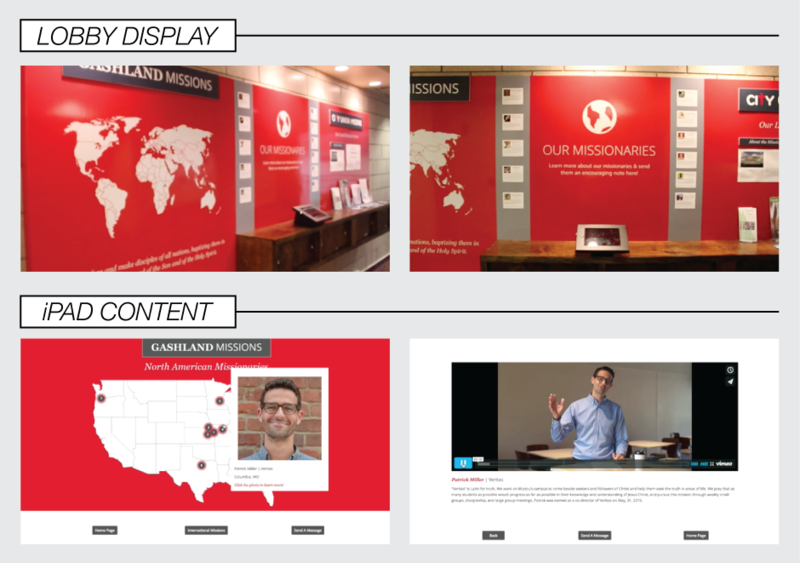 The missions lobby display is well designed, simple to understand and embraces technology to ultimately build community between the church and its missionaries. Gashland has a couple ideas of what they want to do next. First, they want to improve signage all around the building to help people navigate the church better. They also want to improve their “Engage” welcome centers by providing extra training for volunteers to better serve guests. I really like this! We are serving here in the Balkan, while our churches are both in Canada and the Netherlands. I blog: Jannekeonderweg.nl (mostly bilingual) and that is a great way to stay in touch. Blessings! This is awesome work!! Great job!!! I really like the bold, clear graphics and colors used. Amazing work! God bless!